Apple unveiled new versions of the iPhone on Wednesday, September 13th, 2018 at its headquarters in Cupertino, California. It is customary for the company to announce new versions of its products in September. 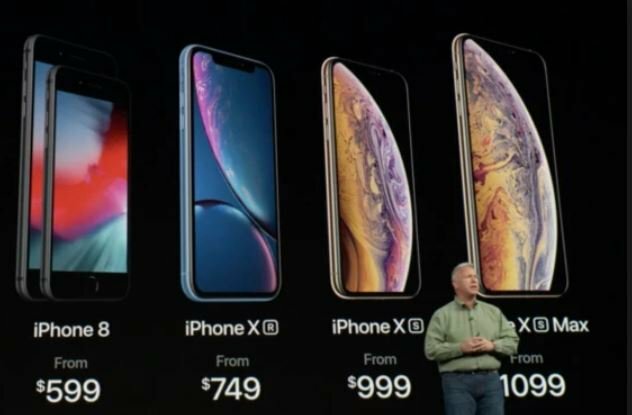 The new iPhone Xr and Xs will be sold at N269,640 ($749) and N359,640 ($999) respectively. The iPhone Xs Max will be sold for N395,640 ($1,099) and N539,640 ($1,499) for the 512GB storage version. All three models come with large displays, minimal borders, no home button and the FaceID camera system for unlocking the device using facial recognition. The iPhone Xr comes with a single camera, rather than the dual lenses other new models carry but has the same 12-megapixel sensor. The case is made of aluminium rather than stainless steel and comes in white, black, blue, coral, yellow, and red. It is available in 64GB, 128GB, or 256GB storage sizes. The iPhone Xs and Xs Max comes with dual camera lenses and dual sim support. Both phones are also said to have the ability to survive two metres of beer and water for up to 30 minutes. The company says all the phones can be pre-ordered from October 19 and it will start shipping the following week. Apple also unveiled a fourth generation of Apple Watch with an ability to perform an electrocardiogram. The watch, sold in the United States from $399, will be available in stores on September 21.